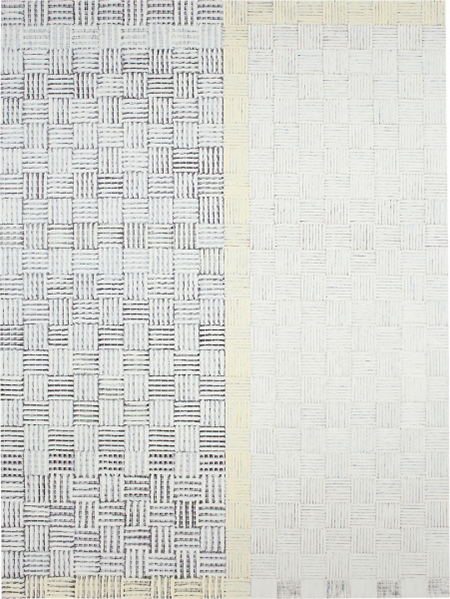 McArthur Binion, "DNA Study: III," 2014, ink, laser print collage, oil paint stick and Staonal crayon on panel, 96 x 72"
Though aesthetically McArthur Binion’s paintings are minimal, formal and modernist-leaning, they are enveloped by the context of the artist’s personal history. Binion’s is the kind of story that can easily become romanticized: born in rural Mississippi and raised in Detroit before graduating from Cranbrook Academy of Art as its first African American MFA recipient. After some initial accolades in the 1970s, his notoriety dissipated. Now pushing 70, Binion is in the midst of a career resurgence. In “DNA: Study,” Binion’s second solo show with the gallery (and only a year after his first), he fills Kavi Gupta’s museum-like Elizabeth Street gallery with heroically-scaled paintings made from oil stick and crayon. Alternately obscured and revealed by the gridded pattern of marks are embedded prints: pages of Binion’s address book, photos of the artist as a young man and portions of his birth certificate. While Binion’s persona may be surrounded by a romantic aura, these bits of personal paraphernalia make his works vulnerable and very real.